Being a martial artist I not only practice the arts but include some of Japan’s values in my life. I’m not the type of person who can turn up for class, train and forget about it all till next week. I find the culture and history fascinating even if it’s to just get an insight into how people used to live their lives during the times of war and peace. When I heard there was a going to be a display of koto playing in Manchester I jumped at the chance to see what Japan’s national instrument had to offer myself. 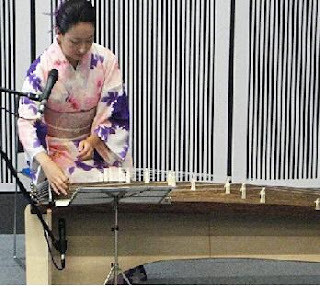 I had not seen the koto played before, I had only heard it on the TV so I knew what it should sound like but as I found out, that is only the half of it. The Japanese Embassy had generously funded a free 40min concert which would be performed by Fuyuki Enokido and was held at ‘Manchester Metropolitan University’. 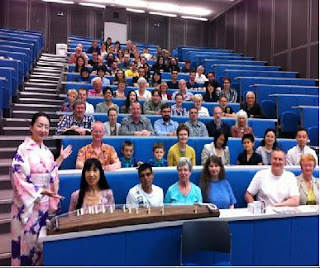 Around 60 people turned up and we were treated to 4 songs played on the koto with explanations given by ‘Japan Society North West’ member, Yuko Howes, before each. We were made aware that Fuyuki had played in over 30 countries and had just been touring Europe since May. She had come from London after performing for the Japan Olympic team and Japanese members. She was to return to Japan at the end of August. Once the music began you realised that the sound really was a small part of her performance. You could see the passion and concentration in the musician and every note was played with full concentration and perfection but just as we do in traditional martial arts ‘Etiquette’ was one of the most important factors. One song named ‘Blessed from Heaven’ was in dedication to Fuyuki’s great aunt who passed away last May. She had taught Fuyuki to play since she was 3 years old and explained how she had to retire due to her backbone and thumb being ‘fused’ due to the amount of playing. The message in the song was given that when her aunt passed, Fuyuki felt that she would be in deep despair until a soul appeared and said not to regret any actions, to listen to the voices coming from heaven and to continue to play till the light fades away. Rather a strong message but containing a lot of meaning. After her display autographs were available and questions answered to wrap up a short but very good performance, and all for free! Many thanks must go to the Japanese Embassy for funding the event, the Japan Society for organising and advertising and also to Fuyuki Enokido for giving her time. Please feel free to check out the following websites to show your support for these types of events.